If you’ve ever suffered from a clogged liver, blood in need of purifying, or an undernourished brain, this is the blog for you. Modern medical professionals have made incredible advances in clinical practice and new lifesaving drugs. It’s doubtful, however, that they are any more enthusiastic or confident about their abilities than their predecessors and one-time competitors, the manufacturers of patent medicines. With products named Orangeine, Curolene, Electric Liniment, Angel’s Oil, Reliable Worm Syrup, and White Star Secret Liquor Cure, these purveyors of health and vitality descended upon the American public in the late 19th and early 20th centuries, promising to calm every cough, move every bowel, shrink every tumor, and destroy every bunion in the entire nation. That is, provided the consumer would kindly ask for their product at their local druggist or send an order in by mail. Patent medicines such as “Father John’s Medicine,” “Retonga Tonic,” and “Swamp Root” on the shelf at Hicks Drug Store in Tallahassee (1961). Patent medicines, sometimes called “nostrums,” have been around for a very long time. In ancient days, Latin speakers referred to such medicines as “nostra remedia,” or “our remedies.” In all cultures, people have experimented with various ways of healing illnesses of all sorts, from pain to itching to cosmetic issues to respiratory distress and sexual impotence. Often, the impetus for this experimentation has been a very noble desire to alleviate the pain or discomfort of loved ones or humanity in general. Producing remedies can also, however, be a very lucrative business. Advertisement for Hires’ Improved Root Beer, including claims that it “purifies the blood.” Notice the ad calls this a “temperance beverage,” a nod to the fact that in some parts of the state a movement was afoot to prohibit the sale and manufacturing of alcohol (circa 1900). In the 18th and 19th centuries, advancements in packaging and advertisement made it possible for makers of patent medicines to promote their products far and wide and capture the interest of a broad audience. With mainstream medicine still lacking full understanding of even some basic diseases and conditions, suffering patients were often open to trying patent medicines they found in the drug store or the newspaper. It was almost impossible to know whether a product had truly been tested for effectiveness (or toxicity) or even endorsed by anyone with any medical training at all. With virtually no laws governing the manufacture and sale of pills, elixirs, and other remedies, advertisers could essentially make up whatever they wanted about the product. After all, they frequently said, they were more than happy to refund the purchase price if the product didn’t work. 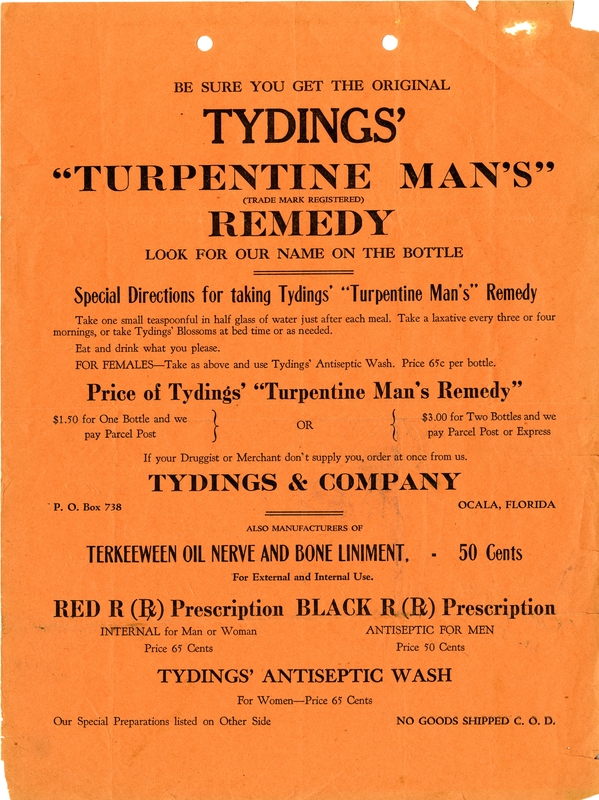 Broadside for Tydings’ “Turpentine Man’s” Remedy (1939). And that’s the kicker. Patent medicines often did work, although usually not by doing what they were advertised to do. They often contained high doses of alcohol, cocaine, morphine, or opium, all of which were generally legal to possess and mix into medicines at this time. It’s hard to say whether a patient’s heart palpitations, fever, or unpleasant digestive problems were really solved by the elixir they swallowed, but then again how could they tell? After a healthy dose of this or that miracle potion, they were probably in too pleasant a fog to stand up, let alone contemplate pain. A page from the diary of Dr. John M.W. 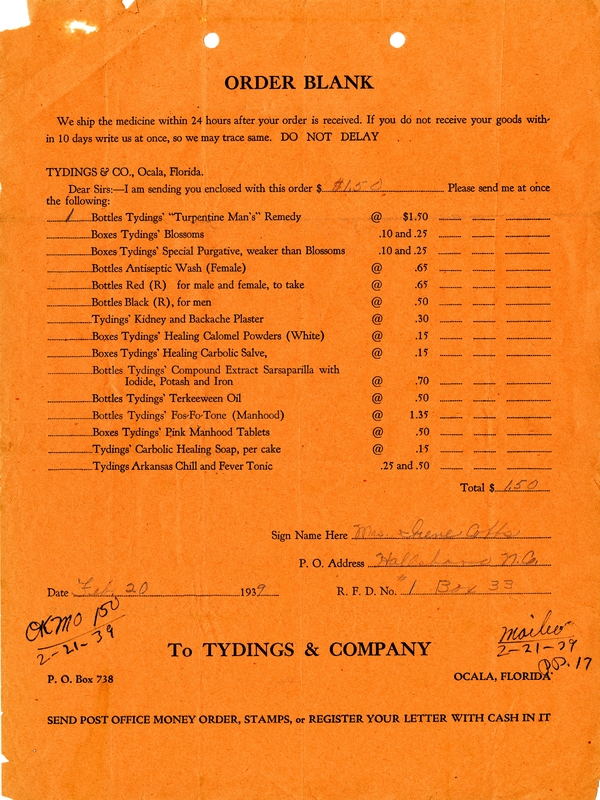 Davidson of Gadsden County, containing recipes for various mixtures he used for patients. Click on the image to view more of the diary and a transcript. In earlier days, physicians were little help in combating the problem. They themselves were unsure in many cases how to bring their patients relief, and they frequently turned to some of the same intoxicating ingredients used in patent medicines. As medical knowledge increased and practitioners began organizing themselves and standardizing their practices, they began criticizing the patent medicine manufacturers. Doctors argued that while patent medicines did not cure illnesses, they did discourage patients from seeking legitimate medical care, and in some cases caused them to descend into dependency on alcohol and other addictive drugs. The potion makers did not go quietly. As pressure mounted, they enlisted the support of the newspaper industry, which received a hefty amount of revenue from patent medicine advertisements. Over time, however, lawmakers opted to err on the side of safety. State laws began requiring products claiming medicinal properties to disclose their ingredients. In 1906, Congress passed the Pure Food and Drug Act, granting the government authority to place tighter regulations on food and drug labeling and advertising. Margaret B. Barry and her son Bill at the family drug store, Suwannee Drug Company, in Newberry (photo circa 1908). Today, in Florida and across the nation, strict laws and procedures tightly control the availability of many of the ingredients that once made patent medicines so potentially dangerous. Various “cures” and homeopathic remedies still exist, and many swear by them, but compared to the “liver salts, “stomach bitters,” and other elixirs of yesteryear, they are much safer to use. What’s the craziest sounding cure-all you’ve ever seen? Tell us about it by leaving a comment, and don’t forget to share our post with your friends on Facebook!